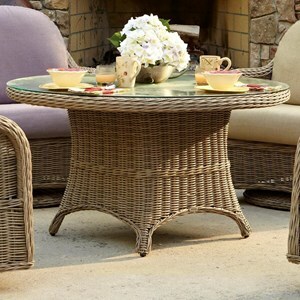 Gather friends and family around this chat table for great times in your backyard. The piece features a resin frame that gives the illusion of woven rattan. A glass top provides an easy to clean surface and a touch of elegance to complete the look. 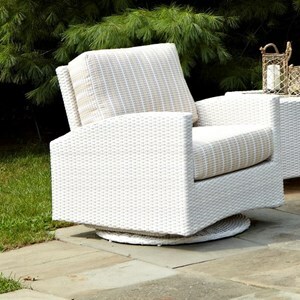 With its clean lines and woven design, this swivel glider chair offers contemporary outdoor style. A Parchment finish creates a fresh look, the perfect base color to complement any of the hundreds of fabrics you can choose from for the seat and back cushions. 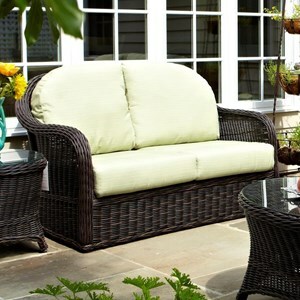 Create a great outdoor space to entertain and relax with this outdoor loveseat. The piece features a durable metal frame and plush cushions for comfort. Customize the loveseat by choosing from a variety of fabric options to create the perfect look for your space and style. 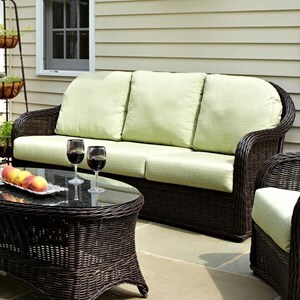 Create a stylish space to relax with family and friends right in your backyard with this outdoor sofa. The chic piece features clean lines with curved track arms for a contemporary silhouette, while the woven construction captures casual tropical style. 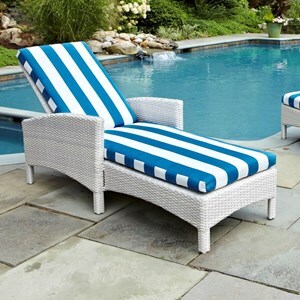 Lounge under the sun with this adjustable chaise lounge. The piece features a woven resin frame that offers durable and fresh style. The included cushions promise comfort, while the back reclines to give you the perfect position to work on your tan. Featuring clean lines and a woven design, this cocktail table has a casual contemporary look that's perfect for your outdoor space. The tempered glass top offers an easy-to-clean surface, while the Parchment finish highlights fresh style. 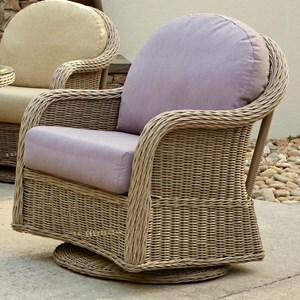 Enjoy the outdoors while relaxing on this swivel glider chair. 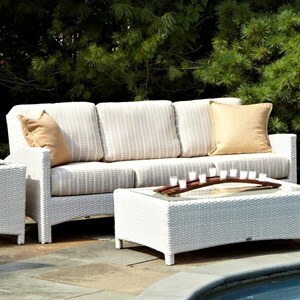 The simple piece has a woven frame and plush seat cushions to ensure durability and comfort. Customize the cushions by choosing from a variety of fabric options.